It is fairly sweet and simple to migrate item data to your EZRentOut database. All you need is your Items’ data in the excel sheets. When importing item information, you can also create groups, location, and vendors these items are associated to. Note: You can import a maximum of 1,000 records at a time. 1) First step should be determining which columns in your excel sheet map to which fields in EZRentOut. – There should not be any merged cells in your excel sheet. – There should be only one excel sheet in the file you’re uploading. If your items are spread across various sheets within the same file, split these sheets into separate excel files. – All dates should be in mm/dd/yyyy format. – For yes/no fields e.g. Retire?, put yes against the assets that should be in the retired state when imported. – Asset Identification Numbers (if you’re using them) need to be unique. Ensure that there is no repetition of an Identification Number in your excel sheet. Moreover, they should only contain Alphabets and Numbers (no special characters, spaces etc). – All names should be at least 3 characters long. 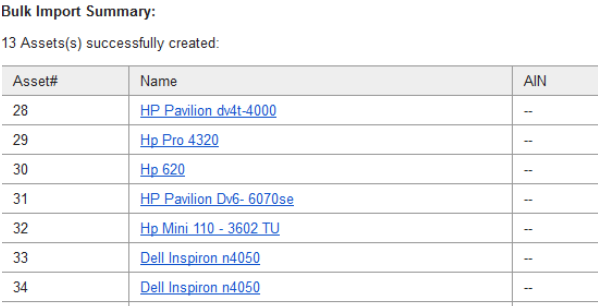 For example, if you have a vendor called ‘HP’, rename it to ‘HP Laptops’. – When importing inventory records, if you are specifying the quantity to be added to stock, Stock Price column must also be mapped. 1) If your goal is to do excel imports multiple times, you may want to create a Mapping Template from New Import Template ->Map Columns -> Create Bulk Import Template so that it can be used in the future whenever you need it. Sample files are uploaded for your ease. All Custom fields are visible in the wizard when mapping the data columns. See image below: 2) Or you can directly map the columns after you upload the excel sheet. Map columns in the same way as shown above. 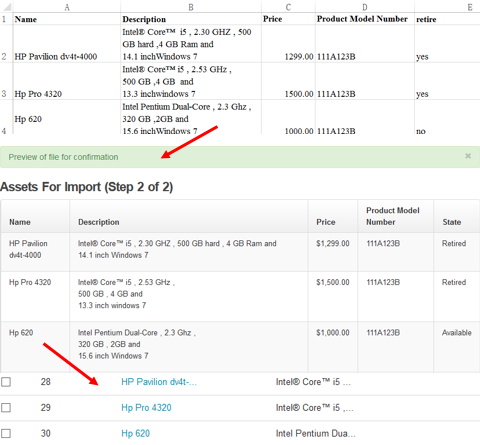 3) Once you’ve uploaded the excel sheet through a template, you’ll see a preview of the import. If not using a template, you’ll see the preview after mapping the columns. If you are satisfied with how your items turned out after mapping the data, click the Import button. Depending on your file size the uploading process might take some time. Do not take any action on the import wizard while the import is in progress. You can, however, continue to work with EZRentOut in a new tab/window. You may want to grab a cup o’joe or check out some videos in the meanwhile. This entry was posted in [Support], Customize, data import, Equipment Rental, Getting Started, productivity and tagged asset management, asset tracking, bulk import, excel import, ezrentout, import items, import template, rental management, types of items by admin. Bookmark the permalink.